Oops, you think I’m in love, ob-sessed with a vegggg-tuhhhh-ble. Bring a medium pot of water to the boil, then add the cauliflower florets and cook for 5 mins. Lift out a piece to test for doneness, it should be easily pierced with a knife. Drain the cauliflower in a colander, then tip into an ovenproof dish. In the same pot you used to parboil the cauliflower, melt the butter. Once the butter has foamed up and gone down, add the flour and whisk whisk whisk. Keep whisking as the mixture starts to bubble up and begins to turn golden, about 3 minutes. Start to drizzle in the milk, just a splash at a time at first, still steadily whisking. Don’t let it get thicker than pancake batter or it’ll be tough to get the clumps out. After you’ve added half the milk in small splashes you can add the rest all at once. Give it a good final stir and crank the heat up a little bit, no higher than medium, until the sauce begins to bubble and thicken. This will take as long as it takes, but it won’t take long. The sauce is where all the flavor of the dish comes from, so give it your full attention for just a few minutes. Once the sauce has thickened enough to coat the back of a spoon (and looks something like a thinned out alfredo sauce), remove from the heat and stir in the grated cheddar cheese until completely combined. Taste and adjust seasoning if needed. It should be fairly thick at this point. Pour the cheese sauce over the cauliflower and smooth it with a spoon. Put in the oven and bake until the top is brown and the cheese is bubbling. 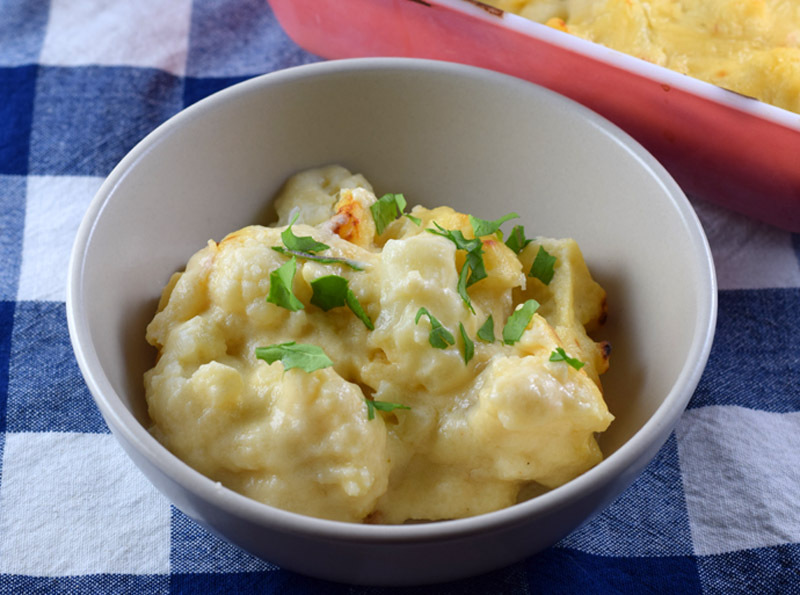 Note: I opted for a smaller baking dish and layered cauliflower-sauce-cauliflower-sauce for a more casserole-like vibe (as shown in photos above). You could also sprinkle some buttered breadcrumbs over top to make it more of a gratin.